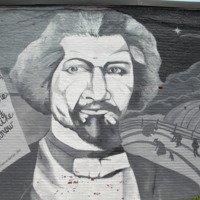 In 1860, Frederick Douglass took to the stage at Boston's African Meeting House to give his speech, “A Plea for Free Speech in Boston.” Muralists Deborah Browder and Heidi Schork transcribed words from the speech onto their mural at Hammond and Tremont Street. “Liberty is meaningless when the right to utter one’s thoughts and opinions has ceased to exist,” Douglass pronounced in 1860. Three years later, in the same Meeting House on Joy Street, Beacon Hill, African American soldiers, including two of Douglass’ sons, were recruited into the Fifty-fourth Regiment of the Massachusetts Infantry under the leadership of Colonel Robert Gould Shaw.